Based in Maryland, Angela Lang has been a freelance writer since 2010. She has been a registered dietitian since 1998 and is an avid nutrition educator in areas including diabetes, cancer and weight loss. Lang's interests include healthy eating to reduce obesity and disease. She holds a Master of Science in human resource development from Towson University. The desire to turn back the hands of time may have you considering a cosmetic procedure. Two popular procedures targeting individuals desiring a younger looking face are microdermabrasion and chemical peels. Both procedures can leave your skin feeling smoother and may even out your skin tone. It's important to consult with a dermatologist prior to initiating treatments and have them performed only by an experienced professional. Chemical peels and microdermabrasion are procedures which exfoliate the skin to improve the appearance of skin imperfections. Microdermabrasion works best for superficial skin imperfections such as fine lines and wrinkles. Chemical peels are most effective on serious skin problems such as deep wrinkles and scars. According to the American Academy of Dermatology, both microdermabrasion and chemical peels treat age spots, dull complexion and uneven skin tone. 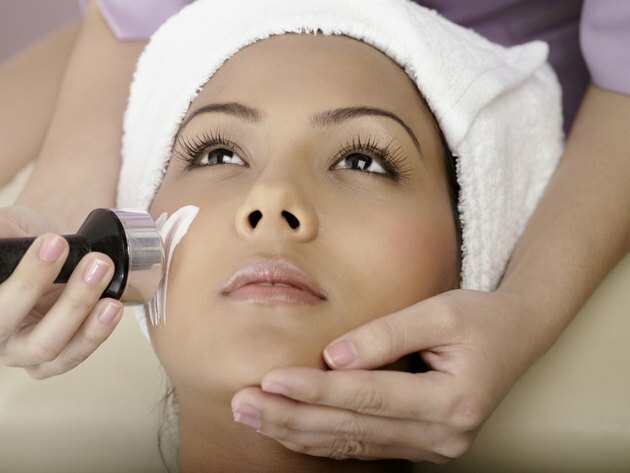 During microdermabrasion, fine crystals are sprayed onto the surface of the skin. The purpose of this procedure is to remove dead skin cells on the top layer of the skin. The American Society of Plastic Surgeons says that microdermabrasion "helps repair facial skin that takes a beating from the sun and the effects of aging." This procedure offers the skin a 'rosy glow' but will not significantly change the appearance of the skin surface. This procedure does not improve wrinkles or skin discoloration. Chemical peels improve the skin's appearance from slightly to significantly, depending on the procedure you select. Chemical peels remove the damaged uppermost layers of skin, according to the American Society of Plastic Surgeons. Chemical peels are used for both cosmetic purposes and for medical purposes, such as removing pre-cancerous growths. This procedure usually has noticeable results. Both procedures take about 30 minutes to complete and are effective on the face, neck, chest, back and hands. These procedures are offered in doctor's offices, spas and salons. Over-the-counter versions are offered for both microdermabrasion and chemical peels. The American Academy of Dermatology reminds patients that these at home treatments are less effective than when completed by a professional. Chemical peels are available in different strengths: mild, medium and deep. Deep chemical peels can be painful and may require the use of an anesthetic. Chemical peels also often require a recovery period of up to three months involving face bandages, painkillers and antibiotics. Side effects of chemical peels include burning, swelling, and permanent changes to the color of the skin. Microdermabrasion does not vary in strength. A mild tingling and warm sensation are likely to be felt during microdermabrasion. Recovery from this procedure generally takes a few hours but may take a few days depending on skin sensitivity. The American Academy of Dermatology believes side effects of microdermabrasion are mild, generally only redness and stinging. Generally, chemical peels are more expensive than microdermabrasion. For maximum effectiveness, six to 12 initial sessions of microdermabrasion should be completed. Chemical peels vary greatly in price based on the level of treatment selected. Both the mild and medium treatments require several treatments, while the deep peel is done just once in a lifetime. The average costs for both microdermabrasion and chemical peels are between $100 to $4000 per treatment, according to Oprah.com. How Often Should You Use a Glycolic 30% Peel? Will Salicylic Acid Peels Help the Skin?